Meet Phoenix Integration at the ALTAIR Partner Alliance 2019 Automotive Event in Boeblingen, Germany on May 27-28, 2019. Attend our presentation regarding “State of the Art Process Integration Simplifies Multidisciplinary Modeling of an Electric Motor for an Automobile” on May 28, 2019 at 15:00 CEST presented by Ilya Tolchinsky, Lead Application Engineer, Phoenix Integration. ModelCenter’s powerful integration capabilities simplify building automated multidisciplinary workflows. 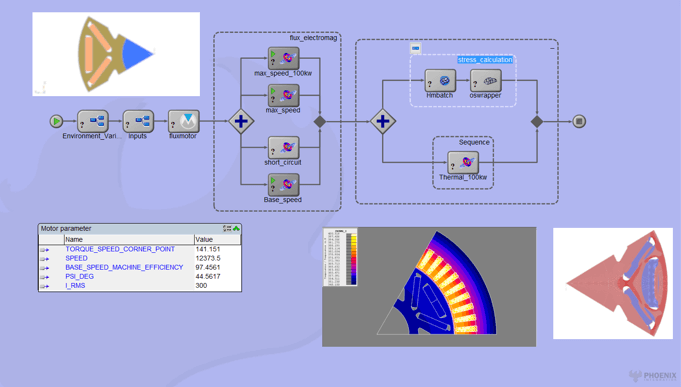 This enables the Altair Hyperworks software suite to be integrated in highly complex applications. In this example ModelCenter was used to solve an industrial multidisciplinary design problem, the design of an electric motor for an automobile. Electromagnetic, thermal, and structural performance criteria are simultaneously considered to design an efficient motor. The individual disciplines are evaluated using Altair solvers – Flux Motor, Flux, and OptiStruct. ModelCenter provides an easy way to connect the different analysis tools into a sophisticated workflow. There is a graphical representation of the workflow which makes clear the order of execution of the components and the data dependencies between them. When components do not depend on each other, it is possible to run them in parallel to reduce execution time. The workflow is executed by HyperStudy to search through the design space and find the best answer. To arrange an on-site meeting at the ALTAIR Partner Alliance 2019 with our Technical Manager, click here.